Leif S. Peng is a Canadian cartoonist and illustrator who has created artwork for many corporate clients, including Nintendo. He has spent time as a researcher and writer of mid-20th century magazine artists, maintaining a popular internet blog called "Today's Inspiration", as well as teaching graphic design classes at Mohawk College in Hamilton, Ontario. Leif studied art at Sheridan College in Brampton, Ontario. After graduation, he worked as a renderer at an advertising agency in Toronto. After the passing of a colleague named "Bud", Leif received a filing cabinet full of illustration clippings from The Saturday Evening Post, Esquire and other well-known magazines at the time. Over the years, Leif was often "pouring through Bud's files" for ideas and inspiration for his own illustrations. In the early 2000s, he decided to scan a 1950s pin-up girl illustration and email it to several friends, with the subject line "Today's Inspiration", which was met with much enthusiasm, and the email list grew over the next two years. In 2005, Leif began his "Today's Inspiration" internet blog, which allowed him to annotate the posts with his own thoughts as well. As interest and popularity in the blog grew, Leif developed an interest in learning about the business and artists behind the mid-20th century classic magazine images. He began collecting his own magazine material, either sourcing them online or through second-hand bookstores. Leif has been contacted by "dozens" of family members of the artists of the illustrations, and sometimes even by the artists themselves. He has spent time researching, interviewing and writing about mid-20th century illustrators, even crowdfunding an artwork book showing the work of Ken Dallison, a prolific car and truck illustrator. Other than blog posting and research, Leif has worked in promotional marketing and logo design for corporations such as Nestlé, school textbook illustrations for the Oxford University press, and children's book covers and interior illustrations for Nintendo and HarperCollins. In 2007, Leif received the Award of Excellence in Illustration from the Society of News Design. 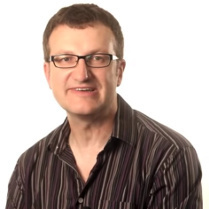 From late 2009, Leif has been a professor and instructor in the graphic design program at Mohawk College in Hamilton, Ontario. His son, Simon, has also been involved in illustrating. 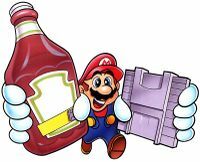 Artwork by Leif Peng, showing Mario holding an unlabelled bottle of Heinz Tomato Ketchup, and a Super Game Boy cartridge. In the 1990s, Leif created an artwork for Nintendo which was used as a backing card for Heinz Tomato Ketchup, featuring Super Mario. He has also illustrated a Super Mario birthday card, licensed to the direct mail division of Leo Brunette. Between 1994 and 1997, Leif contributed line illustrations to all three Donkey Kong Country children's books, which are published by Troll Communications and feature characters and similar plots from the Donkey Kong franchise of games. Leif later illustrated the step-by-step sketches seen in the How to Draw Donkey Kong & Friends book. ↑ About Leif Peng. Flickr. Retrieved February 13, 2017. ↑ Ken Dallison - A Life in Illustration Kickstarter. Retrieved February 13, 2017. ↑ About Leifdrawing101 Blogspot. Retrieved February 13, 2017. ↑ Comment posted at "Super Mario backer card art" by Leif Peng Flickr. Retrieved February 13, 2017. This page was last edited on March 15, 2018, at 14:14.